The lovely fall weather we’ve been having; sunny and almost warm! The beautiful mountain views all around the city. Of course, our family and friends. As the season of thankfulness is upon us, we know we have a lot to be thankful for. What are you thankful for this year? We’d love to hear from you! 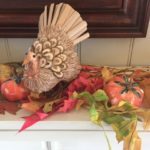 This entry was posted in Charlottesville, Charlottesville VA, Fall, Foxfield Inn and tagged charlottesville, holidays, thankful, thankfulness, thanksgiving by Foxfield Inn. Bookmark the permalink.